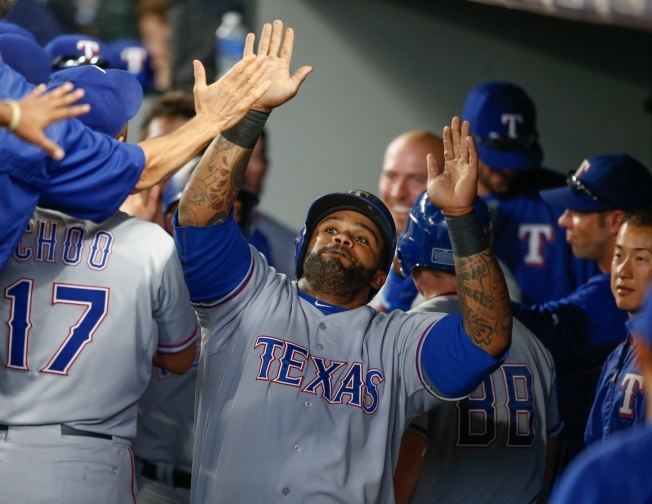 The Texas Rangers scored eight times in the 11th inning, including a two-run homer by Prince Fielder, to pull away from the Seattle Mariners for an 11-3 victory Saturday. Texas opened the inning with seven straight hits, the first six off Rob Rasmussen (1-1). Fielder's homer was the eighth hit of the frame and marked the third time this year the Mariners have given up eight runs in an inning. The offensive outburst came after the Mariners wasted a chance to win in the 10th. Shawn Tolleson (4-2) intentionally walked Nelson Cruz and Robinson Cano to load the bases with two outs. Tolleson then struck out Jesus Montero to end the threat. The Rangers scored three times in the fourth on a run-scoring double by Fielder, an RBI single by Josh Hamilton and a bases-loaded walk to Chris Gimenez. The Mariners tied it 3-all in the bottom half. Cruz led off with a double, extending his hitting streak to 18 games -- and eight games with an extra-base hit. He scored on Montero's single, and Seattle also got runs on Mark Trumbo's sacrifice fly and Brad Miller's RBI single. Rangers starter Martin Perez gave up three runs -- two earned -- and seven hits in six innings. Mariners OF Franklin Gutierrez has the flu, manager Lloyd McClendon said. Gutierrez was out of the lineup for the second straight game. Jamie Moyer was inducted as the ninth member of the Mariners Hall of Fame before the game. Moyer's 145 wins with Seattle are the most in team history. "Today means that forever I am a Seattle Mariner," he said.